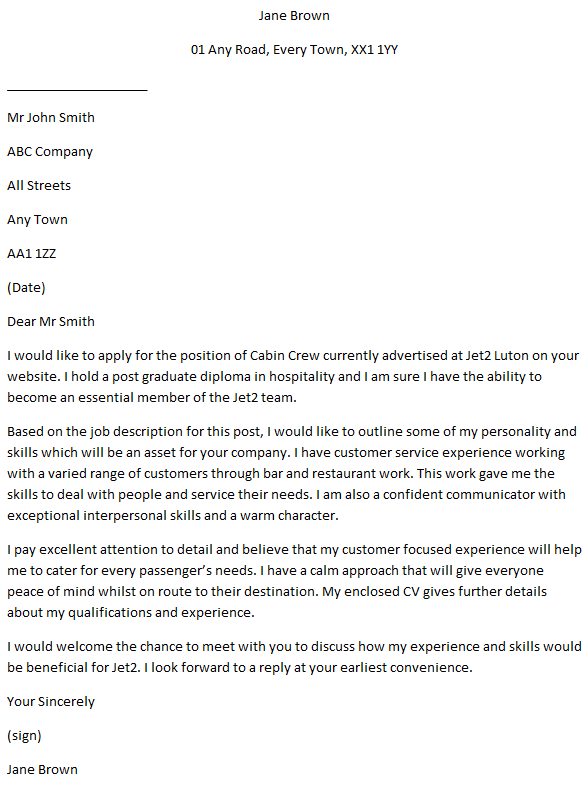 Cover letter example for a Cabin Crew job. You can amend this letter as suitable and apply for latest job vacancies. As a member of cabin crew you will need to be serving customers all of the time. You will need to therefore be good at listening as well as helpful, polite and patient. You will need to show that you have these qualities as well by either mentioning a job you have done which was relevant, such as customer support or sales assistant or describe that you have those skills. You will be more likely to get the job if you can speak foreign languages, or if you have or studying for a degree in hospitality or leisure and tourism so make sure that these are mentioned. There NVQ’s that you can obtain relevant to the job so either mention if you are studying or them or make sure you make it clear that you are happy to learn. An interest in travel is also essential and so if you have travelled a lot, then make sure that you mention that. You will also need a valid passport so that could be worth a mention as well. You will need to be fit and healthy and may need to be able to swim, so if you have these skills, then mention them. I should like to apply for the position of Cabin Crew attendant as advertised recently. I enjoy my job very much, as I love the focus on providing excellent customer service to passengers while ensuring their comfort and safety throughout the flight. I deal with security and emergency situations if they arise and can administer first aid to passengers. As part of my duties, I see that all emergency equipment is in working order prior to take off and that there are enough supplies for passengers. I help any passengers to board the plane and give a demonstration of safety procedures and equipment. Above all, I like to help make the flying experience a pleasant one for the passengers, serving refreshments and meals and gifts and duty free items. At the end of each flight, I ensure passengers disembark safely at the end of a flight and check that there is no luggage left in the overhead lockers; I complete any necessary paperwork, including writing the flight report. I have been working on long haul flights for the past 3 years and would like to change to short haul flights so that I can be nearer to home, hence my application for this position with your airline. I am writing regarding the recent advertisement for Cabin Crew members and I would like to outline my experience and abilities to carry out the role to the high standards expected at (company name). Along with my Diploma in Hospitality, I have had recognition through various training and in-house achievements in customer care. I believe my strong background combined with my relative experience of two years as a Cabin Crew member, makes me an ideal candidate for the role. My knowledge of customer service is always above par and I can keep calm in emergency situations, able to administer first aid to passengers. I have attended regular training and various courses to keep my knowledge up do date and can manage this information while working in a fast paced environment, multi-tasking at all times and knowing how to prioritise my varied workload. I get involved with all aspects of the job from cleaning areas to helping colleagues whenever I am needed and find it a challenging and very enjoyable job. I believe I have the abilities to continue to develop my exciting career with (company name) and I have such high regard for your standards I would be grateful for the opportunity to work for you. Please do not hesitate to contact if you require further information and I look forward to hearing from you in the near future. I would like to apply for the position of Cabin Crew currently advertised at Jet2 Luton on your website. I hold a post graduate diploma in hospitality and I am sure I have the ability to become an essential member of the Jet2 team. Based on the job description for this post, I would like to outline some of my personality and skills which will be an asset for your company. I have customer service experience working with a varied range of customers through bar and restaurant work. This work gave me the skills to deal with people and service their needs. I am also a confident communicator with exceptional interpersonal skills and a warm character. I pay excellent attention to detail and believe that my customer focused experience will help me to cater for every passenger’s needs. I have a calm approach that will give everyone peace of mind whilst on route to their destination. My enclosed CV gives further details about my qualifications and experience. I would welcome the chance to meet with you to discuss how my experience and skills would be beneficial for Jet2. I look forward to a reply at your earliest convenience.